14 responses to Diorama subject? I will bet the guys in back hide the beer in the trees before the boss got there. Rob I am sure you can rise to the challenge. Would look great in a diorama with a recovery tank. 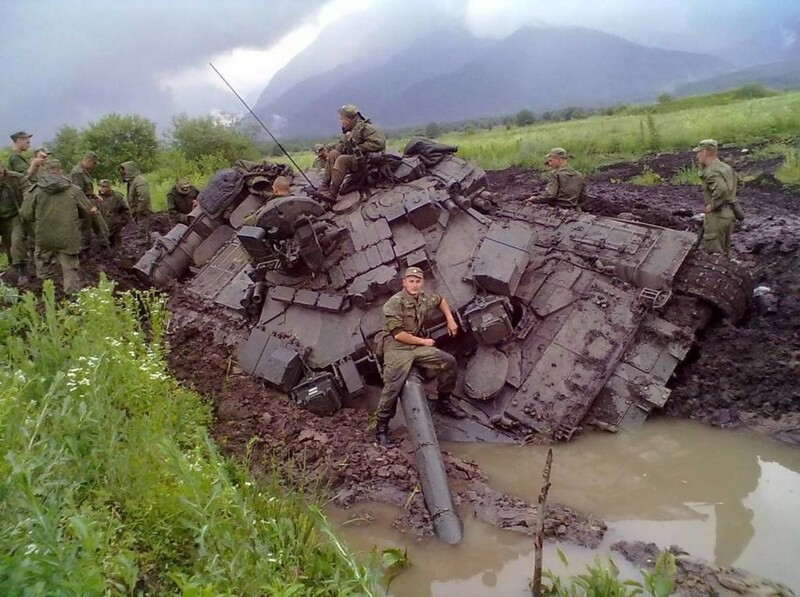 Who ever said you can’t get a tank stuck…? Call two recovery vehicles, send the TC to HQ for a “debriefing”. Any informed guesses as to who,, which, and where? I’m not up on the modern stuff, looks like sovblock to me. Agree with Morne – you da man to do this diorama! Meng do a very nice version of this tank, and also Zvesda do one not quite as nice but in this scene maybe finer points aren’t top of the list. Thanks, Bob! I was thinking T-80, but kinda hard, what with it being submerged. Wonder if the unditching log is equally below water? This is such a great picture! Like some prehistoric monster come to grief.